Easter was in April – which was about 6 months ago. Yikes. 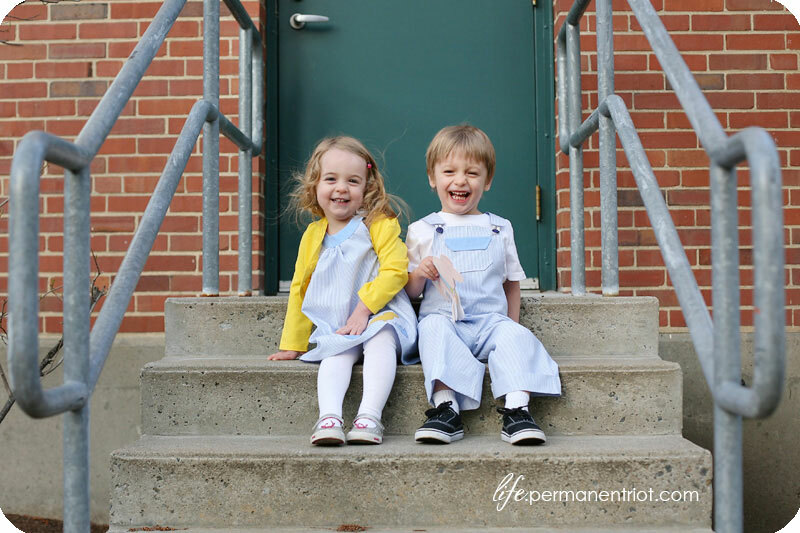 I meant to post these quite a while ago – sewing the kids matching outfits was #25 on my 30 by 30 list. I turned 30 in August and actually checked off quite a few more of the list items, I just haven’t gotten around to writing about them… I really want to do a recap also. In any case I did manage to get this one done on time and I even had big dreams of making a post about how I sewed these dresses – I whipped them up in about a day without a pattern and (aside from the miscalculation on the length of Edith’s dress… it’s a bit short) was pretty pleased with myself about how well they came out. I want to make them more dresses like this (maybe with a few tweaks or alterations to the technique) and if I do I am hoping I’ll get it together enough to document the process for a tutorial. The dresses had a simple split back lined bodice – Amelia’s closes with little adorable yellow round buttons and Edith’s closes with pearl snaps (hard to get a baby to hold still long enough for buttons). The skirt is just a basic gathered skirt and the sash is sewed on the sides and ties with a bow in back. 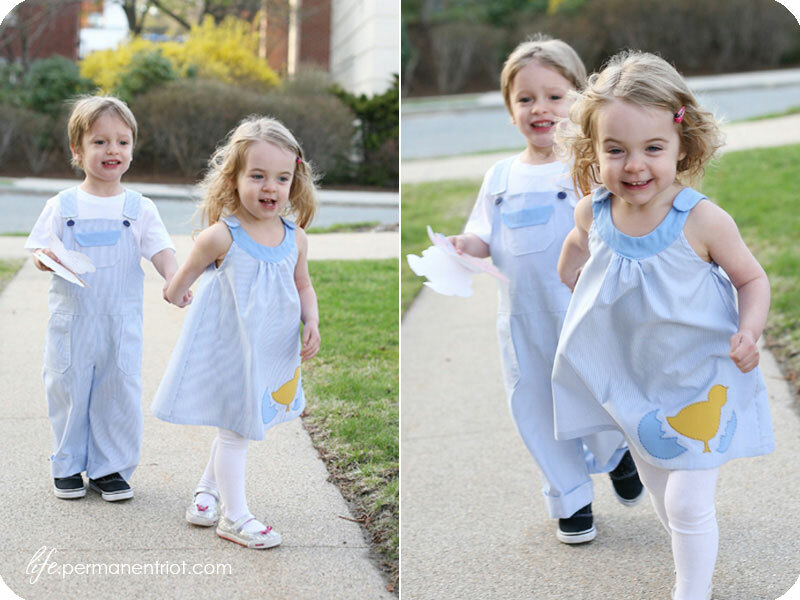 I actually used leftover fabric from their second birthday party – the same stuff that I made Amelia and Paul’s Easter outfits from the year before out of. The chick/egg design is a repeat as well – that’s what happens when you ask a 3 1/2 year old what they want on the dress – they say they want just what they had last time. Oh well. I still think it’s adorable. Paul’s bowtie was made using this tutorial from say yes to hoboken… super quick and easy! One more item crossed off the list. Phew! Sewing… wow… it’s been a while! I’m pretty sure the last big project that I sewed was the kids’ Halloween costumes (did I never blog those either? Oops! They were adorable, I should really post those.) Then my machines got set to the side for a while while I went on a crochet and knit spree for the holidays. After that I took a break from all crafting in general while I was horrifically ill (thanks a lot morning sickness) Now that I’m in the glorious second trimester and feeling great I’m back to crafting again and sewing has been my medium of choice. I decided to make Paul and Amelia outfits for Easter this year, although I kind of waited to the last minute to put them together. I decided that since we were going to be moving soon (actually the move has now already happened, I’m that behind on blogging) that I didn’t want to buy any new fabric that would just end up as scraps in my stash needing to be moved. Instead I used some of the leftover fabric from Paul and Amelia’s birthday party in September – it was originally going to be a pair of overalls for each of them to go with the train theme (and it was also used to make their hats) but I never got around to it and I’ve had a few extra yards lying around for ages now. For Amelia’s outfit I decided to make a snappy toddler dress from prudent baby. I loved how simple and yet adorable the dress is. 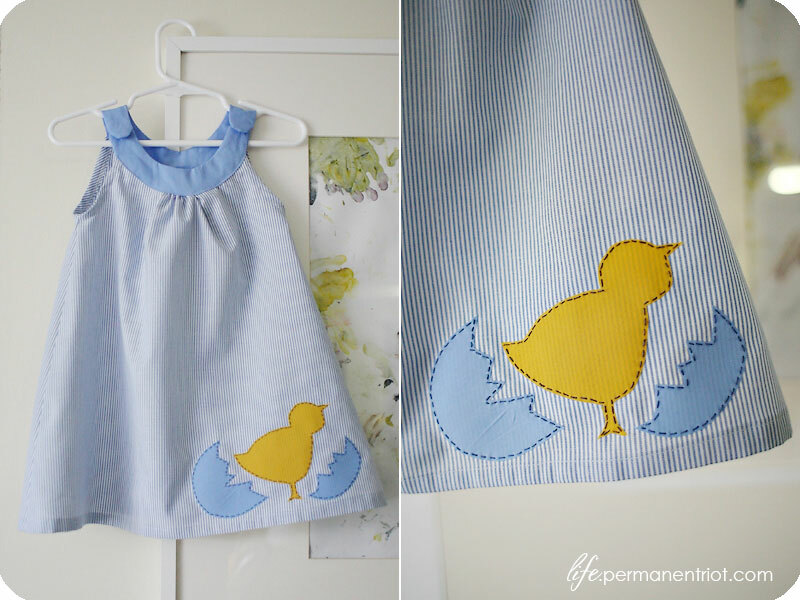 I just used the striped fabric for the main body of the dress, a solid blue I also had in my stash as the collar and some scraps of yellow for the little chick applique. 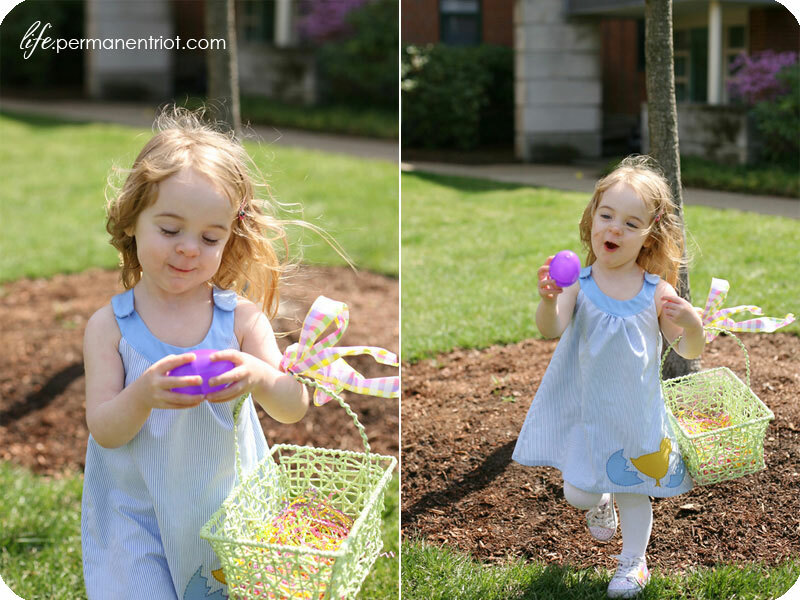 That was Amelia’s addition – I asked her which springtime animal she wanted on her dress and she picked a chick! It was pretty straightforward with the only tricky spot being the attachment of the collar. It was sewed with right sides together and flipped to be pressed, but part of the collar that stays open (to insert the body of the dress) is curved and I found it a bit challenging to press it on a curve when there wasn’t anything holding it in that shape. In the end I think it turned out fine… as with most of my projects the imperfections were jumping out at me when I first sewed it but it is harder and harder to see them as time goes by. Paul finally got that pair of engineer overalls that I had been hoping to make him. One of the reasons I never made them back in September was that I couldn’t find a good pattern. I scoured the internet as well as my local fabric shop (I was willing to pay for a pattern but never found one!) 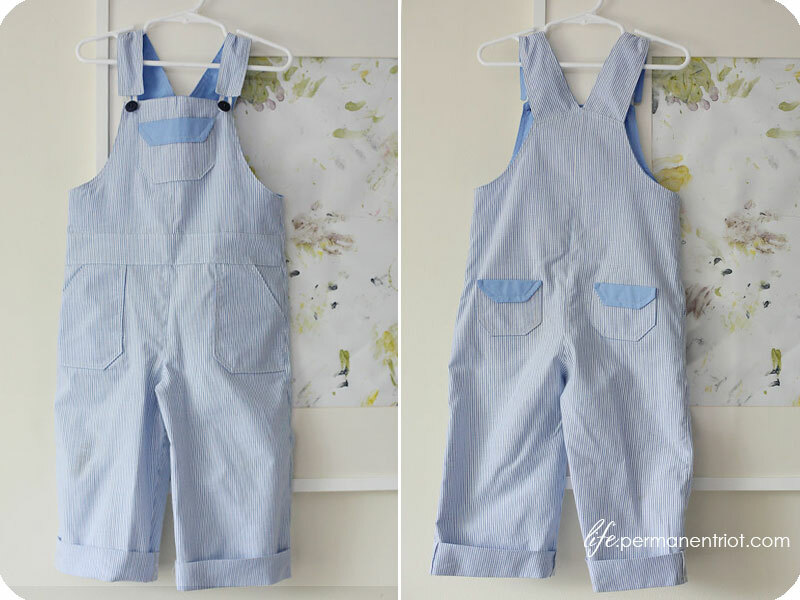 but couldn’t find a good pattern for simple toddler overalls. Lucky for me a pattern had been posted between September and the time that I set out to sew the Easter outfits. 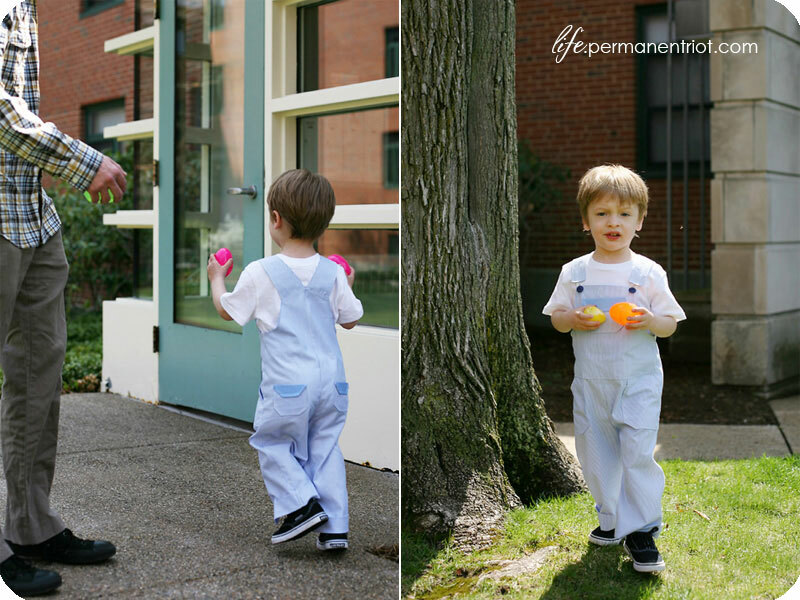 This shortall pattern from ikatbag was perfect – I just lengthened the legs to make it into pants and voila! I have to say that of all the patterns I have tried from the internet this one is in the running for most thorough and clearly explained! It was so easy to follow each of her directions and all of the detailed info on finishing and pockets really made this a durable (and adorable!) project. The kids LOVED their Easter outfits and I had fun taking a few photos of them in the yard both the day before Easter and the day of when they went on their egg hunts. Is there anything cuter than matching toddlers who are super excited?! I think not! Even more exciting I have another post coming in just a day or two… you’ll never believe it… Paul’s quilt is almost done!! Remember when I posted Amelia’s quilt (yes, that was almost an entire year ago!) and said Paul’s was coming soon? Well the finished top traveled with us to Boston last summer and almost came back in exactly the same state that it left in. I had a surge of inspiration (or maybe it was shame at letting a project go so long untouched?) right as we were moving out and got the whole thing basted and quilted and all of the binding attached by machine to the front of the quilt. The only part that isn’t yet completed is the hand tacking of binding onto the back. Hopefully that will be done in the next day or two. Stay tuned!